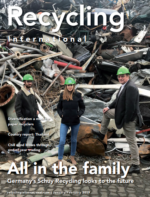 Recycling International is the leading provider of recycling-related information and an invaluable trade publication for the global recycling industry. The publication reaches highly-qualified decision-makers who have control over many or all aspects of company/ organisation budgets, including owners, managers and other professionals. Since its inception in the 1990’s, it has gained a strong following and is read by an estimated 33 000 recycling professionals active across 6500 companies in more than 120 countries. Present your test center Recycling Technology offers suppliers the opportunity to showcase their test centers with a full 2-page photo of the facility alongside details of its specifications and capacities. Target industries: All Recycling industries, including ferrous and non-ferrous metals, nickel and stainless, e-scrap, paper, plastics, and tyres. Every day, recyclinginternational.com reflects developments in the global recycling industries, including business news, product news, technology trends, legislation, and research. Furthermore, the website contains a comprehensive database of published articles as well as a conference and trade show calendar and photo galleries. Target group: recycling companies/ centers, recycling machinery manufacturers, brokers, dealers, scrap producers/generators/consumers, research institutes and government agencies. Recycling Internationals’s weekly newsletter reports on the latest developments and trends in recycling around the globe. It provides the main business, market and product news and informs subscribers on conferences and tradeshows as well as leaders and personalities in the industry. Target group: decision-makers and business leaders, entrepreneurs, managers, scientists, suppliers. Sent out twice a week on Tuesdays and Thursdays. Read the most important and impactful plastics developments delivered for free straight to your inbox. Sent out twice per month on Wednesdays.